New Year, new you…so the saying goes. You may have a few New Year’s resolutions in mind, such as the classic lines of “I’m going to get fitter this year” or “I’m going to improve my diet”. If you’re one of the people with either of these ideas, have you thought about getting your dog or cat to adopt them too this year? At The Insurance Emporium, we’re encouraging people to try to get their furry friends fitter and healthier in 2018. That’s why we’re offering 4 weeks free on our pet insurance policies with the promo code FITPET18 as part of our Fitter Furry Friends campaign. It’s important to ensure that your dog is getting a well-balanced diet and as much exercise as it needs. This helps to combat pet obesity and to protect against various diseases that could come around due to weight gain. To help them become fitter, your pet could be going on longer daily walks with you or even joining you on a weekly Parkrun. In terms of diet, it could be worth making sure they are getting a good balance of protein and vitamins and aren’t eating many grains. With cats, exercise isn’t too much of a worry as they can be a law unto their own! However, you might need to claw back some control over their diet to ensure they stay healthy. They need plenty of water and meat and certain human foods should be avoided, as they can be toxic. It could also be worthwhile taking your cat to a vet for regular check-ups. There are a range of ways to ensure that you have Fitter Furry Friends, with their nutrition and fitness being a major part of this. We’ll be posting some blogs over the coming weeks about things you can do to get your pet healthier and fitter, from advice on improving your cat’s diet to getting active with your dog. If your pet’s New Year’s resolution is to get fitter and healthier, our campaign aims to help them realise it. Pets are an important part of the family and, at The Insurance Emporium, we understand how important your cat or dog’s overall health is to you. To help to give you peace of mind while you enjoy your magical adventures with your pooch or pussycat, we offer flexible pet insurance that can be tailored to your budget and requirements. There are a number of policy types to choose from with a range of Standard Benefits and you can tweak your policy with a choice of Elective Benefits. There’s also up to 30% discount available for new customers looking to insure multiple pets. 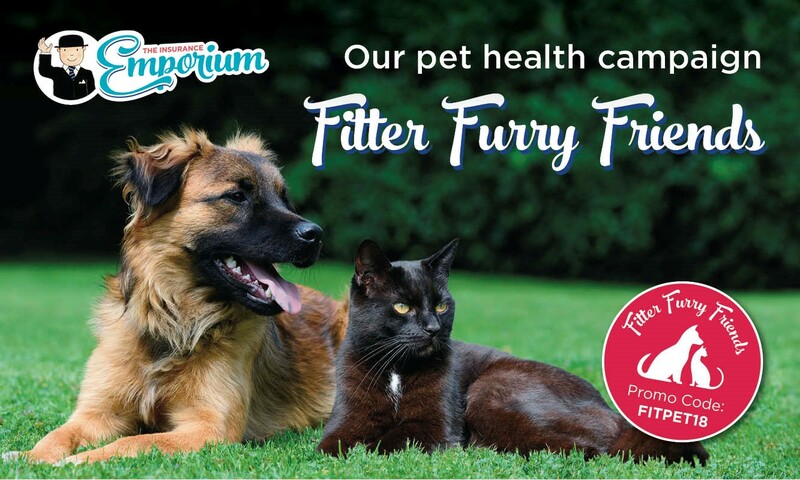 If you’re looking for new insurance for your dog or cat, stop by The Insurance Emporium today and don’t forget to use our promo code, FITPET18, to get 4 weeks free! *Offer is available on lunar monthly policies only and ends 31/03/18.